The first official teaser trailer for Sony's SuperFly remake has been released and it's pretty intense. Before the official trailer was released today, rapper/producer Future released a preview with behind-the-scenes shots as well some as some scenes from the movie, to promote his new music that's included on the soundtrack that he's curating, and because he's a producer on the movie. As for the release of the trailer, it's been pretty quiet, slowly leaking out from cast and crew social media accounts. However, it's not going to stay that way for long. The SuperFly remake stars Trevor Jackson as Youngblood Priest, Jason Mitchell as Eddie, Lex Scott Davis as Georgia, Andrea Londo as Cynthia, Jacob Ming-Trent as Fat Freddy, and Omar Chapparo as Adalberto. The movie is directed by Director X, who was rumored to be in talks to helm the project at the end of last year. Director X is known for helming music videos for artists such as Usher, Kanye West, Jay-Z, David Guetta, Drake, Justin Bieber, Nicki Minaj, and Rihanna. The trailer for the SuperFly remake is gritty and crisp, looking like nothing that X has ever done before. The original Super Fly came out in 1972 and was directed by Gordon Parks Jr. The iconic Blaxploitation movie starred Ron O'Neal as Priest, an African American cocaine dealer who tries to secure one more deal before getting out of the business. The movie also generated two sequels, that failed to live up to the original: Super Fly T.N.T. (1973) and The Return of Superfly (1990). The remake has been met with excitement, especially with Joel Silver producing along with Future, who as previously mentioned, is also curating the brand-new soundtrack. For those hoping for a return of the iconic SuperFly theme song by Curtis Mayfield will be let down. The remake takes place in modern day Atlanta, which means the soul funk that Mayfield brought to the table is replaced with boom bap beats and trap hi hats, which is not a bad thing. The new trailer features appearances from rappers Outkast's Big Boi, Rick Ross, Zaytoven, and The Wire's Michael K. Williams. The soundtrack will more than likely feature Big Boi, Ross, and Zaytoven as well. The SuperFly remake hits theaters on June 15th, and from the behind-the-scenes footage as well as the first trailer, it looks like Priest is going to be turned on to a whole new generation. As Big Boi says, smiling in the video, "I hope y'all don't create a generation of new pimps." The remake is in good hands and it looks like it's going to be an action-packed blockbuster in a summer that's already crammed full of box office madness. Expect a full trailer as well as a soundtrack announcement soon. 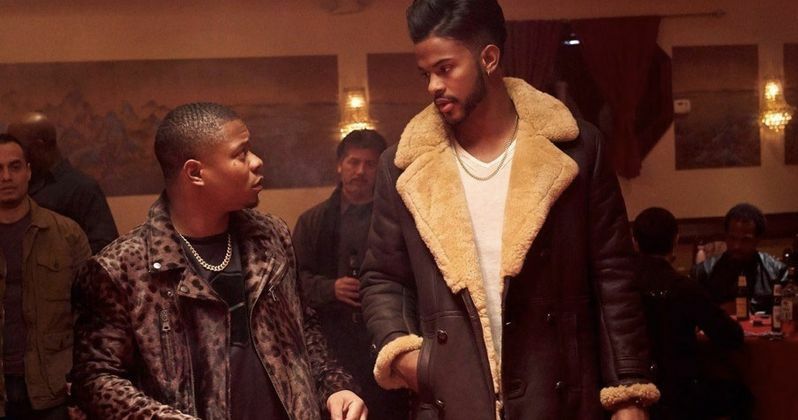 While we wait, you can check out the first teaser trailer for the SuperFly remake as well as the behind-the-scenes video below, courtesy of Jason Mitchell's Instagram account.